Natural disaster, catastrophe and calamity can strike down an individual or a community in an instant, depriving them of food, shelter and clothing. In time societies and families rebuild and renew that which was destroyed. Economic recession can also affect access to the necessities of life but in time, financial balance is usually renewed. However societies disintegrate and can never recover when the vital resources for food, clothing and shelter are exhausted or exterminated. What are societies current necessities? and who controls the available resources? 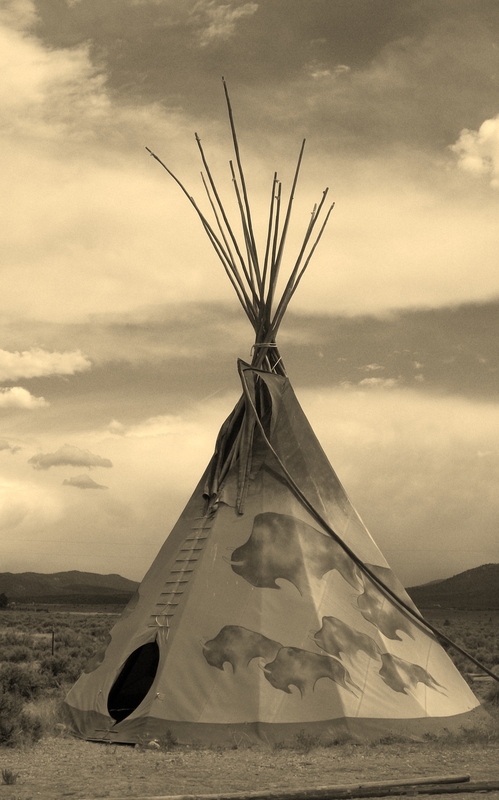 Thipi (Tipi, tepee, teepee) The Lakota words Thi pi means ‘they dwell’ or most commonly ‘dwelling’, referring to the iconic cone shaped tents of the Great Plains tribes of North America. The tipi was an ideal shelter for a nomadic people. Portable for following seasonal advantages, gathering food and forage during summer, moving south in the winter. The tipi was made of wooden poles and an animal hide cover that could be disassembled or reassembled in about an hour. The sloped skin let the rain flow with no catching creases and the wind slipped past with no purchase. A smoke hole at the top had directional flaps that prevented downdraft or rain while being an exit for smoke from a warm interior fire. Light shown in through the translucent skin and light shown out during the darkness of night. The tipi was lightweight, portable and easily transported by dogs. The bison was the primary source of food, shelter and clothing for: the Blackfeet, Arapahoe, Assiniboine, Cheyenne, Comanche, Crow, Kiowa, Lakota, Lipan, Apache, Cree, Ojibwa and Tonkawa—most of them living in tipis for their personal shelters as they followed the great, virtually unlimited bison herds. They were respectful and cognizant of their resources and used every part of the animal; tools made of bone, the hide for shelter, robes and moccasins and of course the foodstuffs and meat. Their nomadic lifestyle left little impact on the landscape, the grasses and all species would regenerate after each seasons passing through. The quality of life was good, the people were healthy, the waters flowed, there was culture and art and a steady resource of bison. They couldn’t live without their bison. Westward expansion by frontiersman, settlers and land speculators had reached the Great Plains by the early 1800s. There where around 60 million buffalo in North America at the time. Believing that coexistence with the Indians was impossible the government and military decided to subdue the Indians into submission by depriving them of the one indispensable resource they needed for survival. General Philip Sheridan had said ” let them kill, skin and sell until the buffalo is exterminated” A buffalo hunter could kill 250 a day. For some years after the Civil War as many as 5,000 hides a day where being shipped out by rail car, 5,000 hides every day. By 1884 only 1,200-2,000 bison were left, by 1890 there were only 750 alive. The Indian tribes gradually gave up their tipis and moved on to government reservations. They were decimated from disease and warfare, destitute with the loss of no means of survival. Their source of food, shelter, clothing was gone. It no longer existed. What is our 21st century buffalo? Could it be exhausted or exterminated like when we lived in a tipi ? This entry was posted in environment, food, history, the hungry brain and tagged environment, food, history, Society, sustainable. Bookmark the permalink. Very provoking and thoughtful. I guess you could say that in many parts of the world we’re so dependent on oil and gas… Chaos will ensue when these run out, don’t you think? The quantity of oil will become scarce over time slowly and then be regulated. Society will have to make drastic changes but it will. When our water and food are not available in the cities – because that is also dependent on fossil fuel for delivery is the rub. A very interesting, thoughtful and thought-provoking piece of writing! As to the queation what the 21st century’s buffalo might be: even if many people would say it’s oil, to my mind it’s water. We can – difficult though it may be – live without oil, but mankind cannot survive without water. And water is squandered at an alarming rate. It always turns my stomach, when, e.g., I see a golf course with plentyful green grass in the midst of Death Valley, or when I see that the once water-rich Colorado trickles out in mud and doesn’t even reach the sea any more. Mahalo for your response Pit. There are not many that realize how critical our water situation is on the planet. In the developed countries we take it for granted the water will flow thru our pipes – someone controls that water – and us. People take way too much for granted as far as natural resources are considered. I’m afraid mankind will have to learn the hard way about sustainability. P.S. : What does “mahalo” mean? Your writing and photography are beautiful and thought-provoking! Thank you for stopping by my blog! Interesting blog post! Interesting post and a lot of factual information about the Indian tribes. Thanks! Indigenous and First Nations people from Canada to South America have nought. Interesting article Joce. That’s something to think about: what is our 21st Century buffalo? Technology? Oil? Wealth? There are so many things our society depends on to function normally. Even the slightest threat to any one of them has a huge impact. And thanks for the tepee information – it’s fascinating stuff. Agricultural land is being gobbled up at an alarming rate to provide suburban housing. I live in the fertile Fraser Valley of British Columbia. I wonder often how long it will be until we are importing all our fruit and vegetables. What is it indeed. Certainly food for thought. . .